Your meeting/conference room is your first impression to the outside world. Don't let disorganized jumble of cords or cables draped across your conference tables make a poor impression on clients, employees or visitors. So what can you do to boost your meeting room’s or collaborative co-working office space more productive? 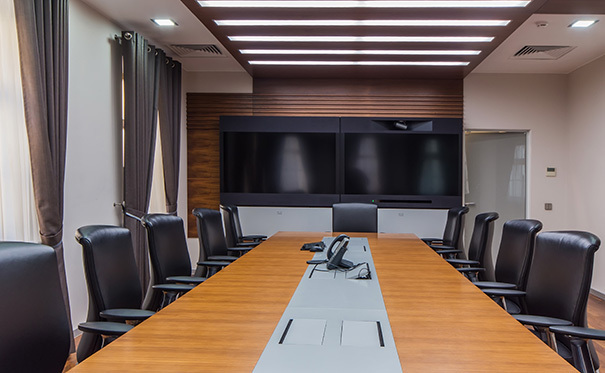 CAV can automate your corporate boardroom or conference room for effective presentations and meetings. From simple data projection to fully integrated video conference solutions, CAV can cater for every client. Our smart, integrated yet highly adaptable meeting/conference room cable management solutions keeps wires and cabling organized and out of sight while also giving better access to communication and A/V services to make them productive. We help you cast your cables aside for meeting room solutions that simplify collaboration and amplify productivity. CAV provides professional data cabling management using an assortment of data cable trays and channel raceways, electrical, communications, Audio/ Visual products to properly route and protect cords and make your conference room both safe, comfortable and aesthetically pleasing. Transform your meeting room and boardroom today! We are just a call away. Call 0402355788 now.